Here is an article written by Amanda Vaill for The American Scholar in which she focuses on the postwar thinkers who stripped the world of preconceptions To read the complete article, check out others, and obtain subscription information, please click here. And Sartre—and Bakewell—are off and running to Germany, where after a lightning flashback to discuss proto-existentialists Kierkegaard and Nietzsche, the author introduces us to Husserl, his student and surrogate son Martin Heidegger (“shy, tiny, black-eyed, with a pinched little mouth … [and] a mysterious power over others”), Heidegger’s student and sometime lover Hannah Arendt, his rival Ernst Cassirer, and his friend Karl Jaspers. 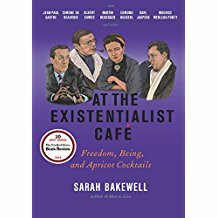 Then it’s back to France, to focus on Sartre and Beauvoir, their charming and urbane comrade Maurice Merleau-Ponty, their protégé and frenemy Albert Camus, and a host of others, from the jazz existentialist Boris Vian to the American novelist (and one-time candidate for mayor of New York on an “existentialist” ticket) Norman Mailer—all of whom are limned in a series of deft portraits and sparkling anecdotes enlivened by apposite illustrations studded through the text.